How do you pass the miles when you have lots of time to occupy your mind? Do you listen to the radio? Ipod? Audio books? Contemplate life? Enjoy the silence (if you can)? When Joel and I go on little road trips we are apt to challenge each other on our music trivia. General topics are selected such as songs about a location or that reference the weather. We’ll volley back and forth until we have a gloater winner. Much to my surprise and delight, Joel recently picked songs that reference birds or flight. Besides singing about other people, does the music world croon about any other living creature as much as it does birds? Lather, rinse, repeat. These are THE ONLY lyrics to the song! You don’t want to miss this gem from 1976. I may add this choreographed dance routine to my exercise repertoire. One of my favorites. Unfortunately no birds make an appearance in this video. Nine different birds are mentioned in this song. Is there any other song that is birdier than this? I always thought the words were “Scott Tissue”. “Scott Tissue that I wish you saw…” and thought it was so odd (but quite a coup for the Scott® folks) that a band like Red Hot Chili Peppers would reference toilet paper in a song. We’re assuming the use of flight is in reference to or similar to a bird’s flight and not insects, bats, angels, or airplanes. A falcon with intact wings makes a few brief appearances in this video. You get bonus points if you knew that this SNL skit this was the inspiration for the title of this post! When you want to instill confidence in yourself, spreading your wings and flying away does seem sexier and more inspiring than, say, lacing up your gym shoes and sprinting away. 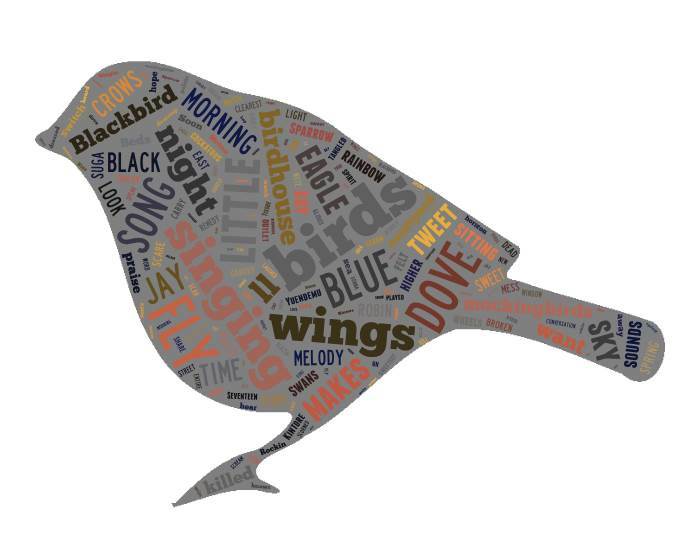 Like the bird song word clouds? 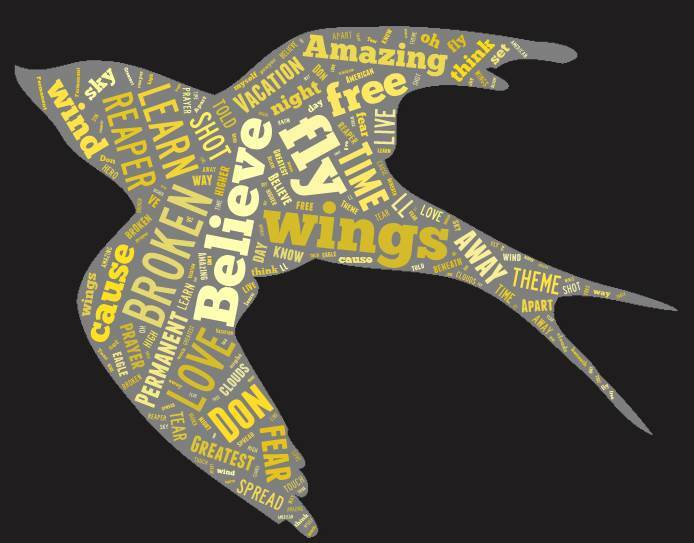 Check out Tagxedo for a word cloud generator with lots of fun options.